A few days ago I figured it was time for me to start my Christmas card making for 2018. I had decided to buy the Hunkydory 2018 collection. While I do have some Christmas stuff left from previous years I don’t think there’s enough to make all I’ll need for this year for my mother, myself, and the small number of family and friends who buy some from me. I actually gave some stuff that had English greetings away to my sister-in-law last year as I make very few English Christmas cards myself – only when specifically asked for them. 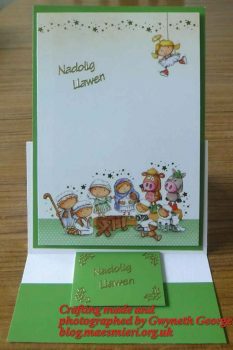 Most of those who come to me for cards express a need for the majority of the cards to be of a size and weight that’s suitable for posting as a standard letter in the UK – nobody wants all their Christmas cards costing more than is absolutely necessary to post. The only time I’m asked for more ornate, dimentional, cards are when they will be hand delivered or when they will be posted inside a parcel. 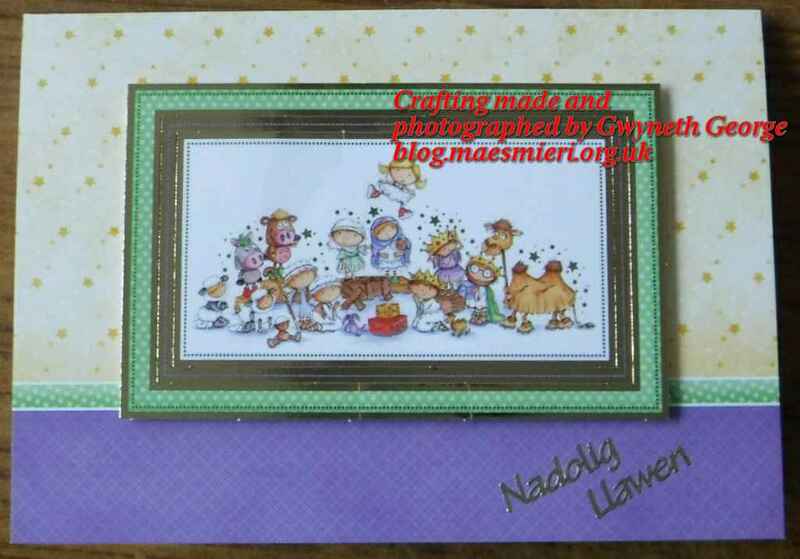 As well as Hunkydory cardmaking stuff I’ve also got some old cards to recycle, some dies and stencils on a Christmas theme, and a few other Christmas cardmaking bits from other manufacturers. But it was to this year’s Hunkydory kit I turned first. 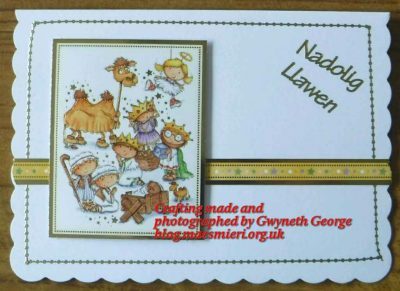 I just picked one of the kit packs from the box and chose one nativity topper sheet from that kit. I hunted out two backgrounds that went with the chosen toppers as well as three sheets of Adorable Scoreable that came in the collection. 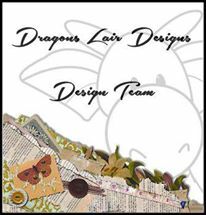 From my crafting stock I collected an A3 sheet of white cardstock, some scalloped edge cards, some peeloffs, assorted tape, ink and stencil. For this first card I simply chose a background sheet from the kit, scored and folded it, and stuck on a topper with 2mm deep foam tape. Taking the other sheet of background cardstock I cut it into two topper pieces, which leaves me with one piece left to use again. One of the pieces I matted and layered and made into an easel card using the scored and trimmed sheet of A3 cardstock and some of the Adorable Scorable. The second piece I matted and layered onto a base card I’d made with the left over bit of the A3 cardstock. 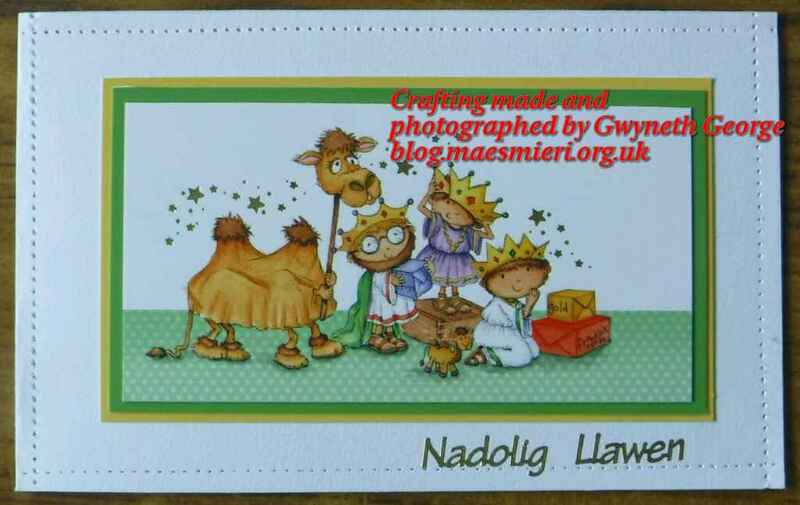 I used the Dreamees perforating tool to put a border around the card. 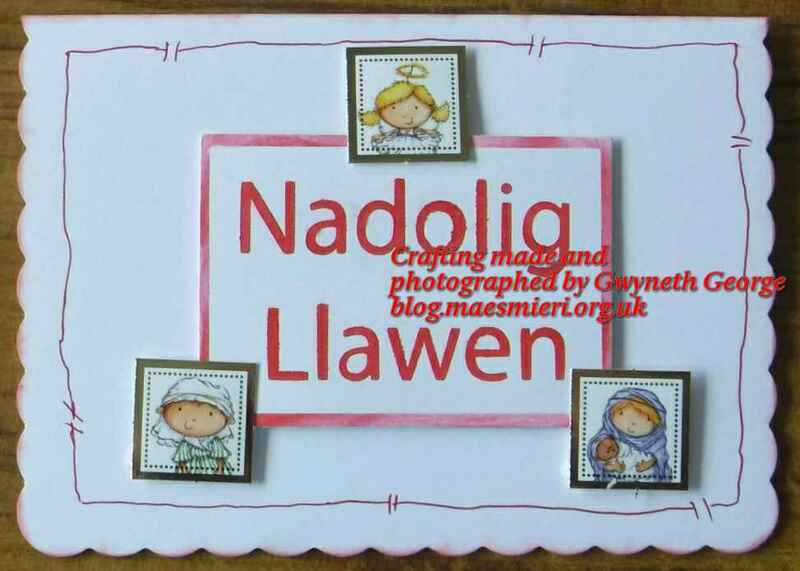 I used a stencil of the words Nadolig Llawen and some red Dinky Inkies and created a greetings topper. 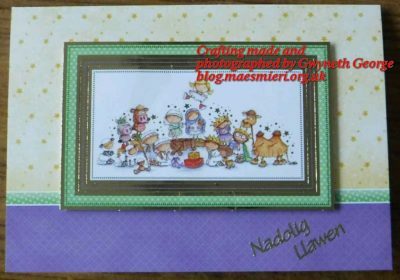 The sheet of Hunkydory toppers had three very small images on it, so using these, my stenciled greeting, and a scalloped edge 6″ square card I made this simple card. For this card I put peeloffs around the outside of a 7″ x 5″ scalloped edge card. Attached a paper ribbon from the sheet onto the card ftont using finger lift tape. And attached the topper using 2mm dee double sided foam tape. For this card I took a 6″ square card, put on two pieces of green Adorable Scorable, stuck on the topper, and went round the edges twice with a fine marker. 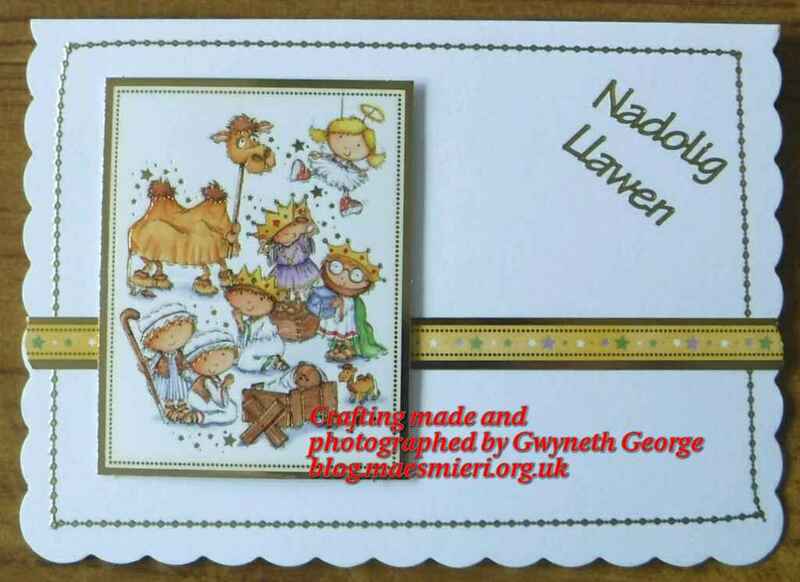 So, there they are – my first batch of Christmas cads for 2018. That’s it for today. 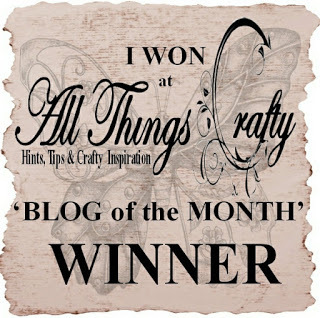 More crafting TO COME before too long, so please do pop in for a look again. 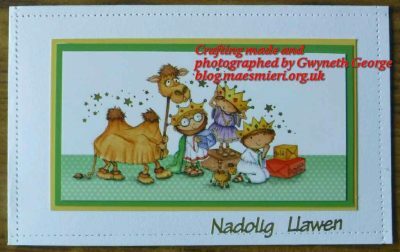 These are fabulous Christmas cards – notice that a few people have started posting them on blogs recently. Love these cute little Naticity scenes – gorgeous!!! So many great cards today! A great selection of Christmas cards to share , thank you . 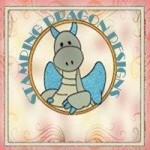 There are delightful toppers and some clever additions like the doodling edges and the perforated border . Lovely cards. You’ve made a great start to your Christmas Cardmaking.